A PB in December. Say what!? The weather is colder, the days are shorter, and the shops are full of Christmas paraphernalia. That means that it was time for my annual December trip to Lanzarote. 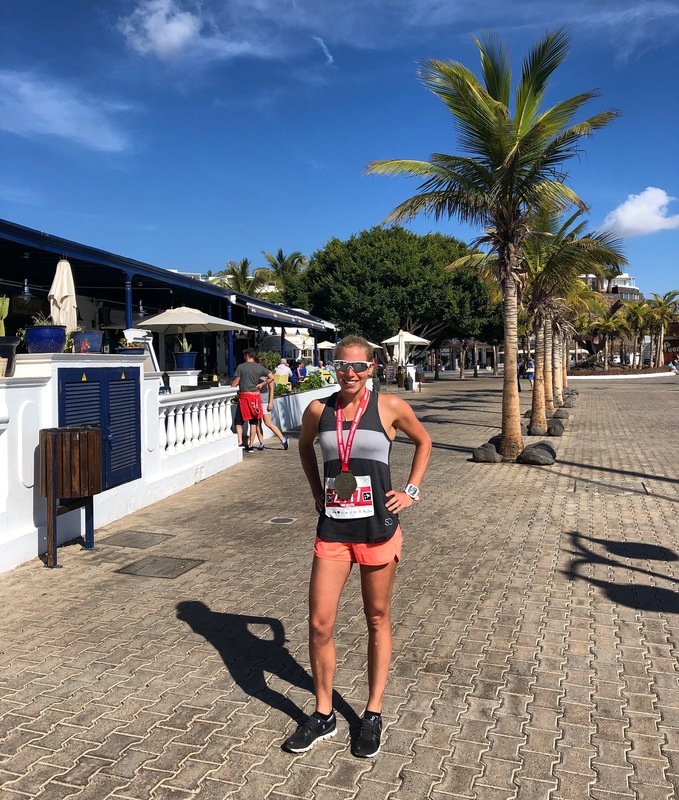 Having become something of a tradition since a few years ago, when I happened to end a training camp with the 10k race at the Lanzarote Marathon, it’s a perfect escape from the hectic run up to Christmas. What’s more, it’s also a great way to kick off the new season’s training. So, in the spirit of not breaking tradition, off I went to Tri Sports Lanzarote to meet a couple of friends for sunny rides and coffee stops in abundance. Interestingly, I haven’t been on a training camp since I have been on Thyroxine, after discovering earlier this year that I have hypothyroidism. So I was intrigued to see how I would get on now I was less fatigued. Although it wouldn’t be a ridiculous week, we were going to chuck in a fair amount of volume – take the opportunity while you can, right!? The idea was to get as much out of the warm weather training week as possible – i.e, getting some endurance volume in while I have the opportunity, but also to have a good hit out at the Lanzarote Half Marathon at the end of the week. My coach readily admitted that I’m “not going to get a PB or anything” but it was worth consolidating the week with a strong race at the end. We decided to front load my training week, by putting in some pretty heavy volume over the first few days, a few lighter days in the middle, and then building back up to the half at the weekend. As long as the sun was shining, I was ok with whatever! Usually, only a month or two into training after my end of season break, I’m not really at my fittest in early December (funny that). Fully taking advantage of the off season, a few too many glasses of wine and some end of season indulgence; not the greatest combination for December fitness. This time was a bit different, because I had finished my season earlier in early September, which meant everything had been pushed forward a bit compared to previous years. I felt like I was in pretty good shape for December – training sessions had been going well and the numbers were still looking good – specially for this time of year! Having said that, I hadn’t done much on the bike (intensity or endurance wise) over the past few months, but if there’s ever a time and place to get some long sunny rides in, it’s Lanzarote in winter! My first three days of training were around six hours – a LOT more than I usually do at home (I usually average 12-14 hours per week). But I was feeling pretty good on it. Must be all that vitamin D.
The days flew by – amazing how little time you have when you’re training all day! I had a few easier days where I spent most of it working in bed (feet up, PJs on). I was still bashing out some beasty swims, getting in the gym and a couple of race prep runs, so it wasn’t just a case of dossing about, but it seemed to do the trick. On the Friday, the day before the race I had a three hour steady ride but felt quite tired, despite the easier days. An immense coffee and cake stop at the famous Johnnie’s Bakes didn’t even seem to perk me up! Oh well, too late to worry about that now! Now with 24 hours of training in my legs, I resigned myself on race morning to the fact that I wouldn’t be putting in the best time ever, it didn’t really matter anyway as it was only a training run, and that I am tired anyway; so just enjoy it and have fun. In all honesty I wasn’t that psyched for it. After a short warm, up we were ready to begin. My legs didn’t feel amazing so I was just going to hang in there and keep it sensible. I started off and soon settled into a relatively comfortable pace. At 5k (around 22 mins) I realised my pace might not be sustainable and thought I might fade off in the second part. I was holding around 4:30/km and it seemed a bit too speedy for me to be able to hold that the whole way! I got to the 10k mark in 44 mins, still holding the pace well, but I was starting to feel it in my legs. I was strict about taking a gel every 20 minutes and that seemed to be doing the trick. The wind also picked up and I knew that the second half of the course had more ‘hills’ which would affect my pacing. However, a quick bit of calculation and I realised that even if I let my pace slip to 5:00/km (which would be pretty slow for me), then I was on target for being very close to my current half marathon PB. Hmm. Ok, that’s a game changer, let’s go for it! I pushed hard on the up hills not allowing my pace to slip too much, and ran hard on the downhills to recover the average pace. I was definitely feeling it now but the kilometres seemed to just fly past, it was going really quickly. I didn’t feel terrible either, I was holding on well and still feeling strong, albeit with more tired legs. I was calculating and re-calculating at every kilometre as I now realised I was on for beating my current PB. YES! COME ON!!! The last few kilometres really dragged, especially the very last one – that final stretch seemed to go on forever! What is it about the .1 in a 21.1km race!? Finally though, I was pushing hard down the last stretch to the finish and knew I was going to smash my PB by two minutes. I finished in 1:35:24, absolutely over the moon. I knew I was capable of a 1:35 for a half marathon but not on that amount of training in the run-up to it. Now I have even more confidence that I can take further minutes off that time on fresher legs and on a faster course! I was delighted, not only because of the PB which was a huge confidence boost, but also to get such a decent week of training in at this time of year, followed up with a fantastic race result. I was 10th female overall out of over 300, and I wouldn’t exactly consider myself as a runner, so was happy with that result! I’ve had PB after PB this year and it seems that even after an end of season break and some pretty high volume training, I can still hit new levels with my performance. It’s such a massive confidence boost going into the new season and with IRONMAN looming up in 2018. On top of everything else, I had a fantastic week with great people. It’s time to say goodbye to Lanzarote until 2018, but I will be back soon! Time to enjoy some Christmas festivities… where did I put those mince pies! ?